Upper Deck has announced plans for a hockey card giveaway at game two of the Stanley Cup Finals in Vancouver. 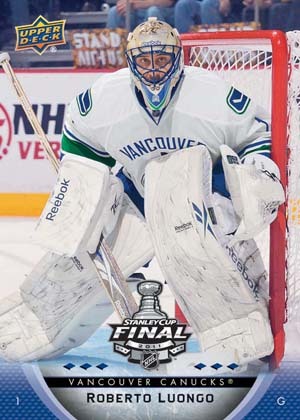 Eight-card promo packs will feature five Vancouver Canucks (Alex Burrows, Ryan Kesler, Roberto Luongo, Daniel Sedin and Henrik Sedin), one checklist, one promo card for Upper Deck's upcoming 2011 Stanley Cup Championship Box Set and one of five Stanley Cup Memorable Moments cards. Upper Deck will also have some instant win cards that can be redeemed at the game. Promo packs will be handed out to all in attendance.